When patients walk through our doors, the first thing they always see are the smiles on our team’s faces. They’re a big reason our patients feel right at home every time they come to see us. Each one has years of experience in the dental field, and they are completely committed to making sure your appointments are always well-organized and flow efficiently. To start getting to know our wonderful team, read on below! Jackie joined our team April 2012. She feels immensely blessed to be a member of a team that values great ethics and genuine concern for our patients. Jackie began her journey in the field of dentistry when she earned her Dental Assisting Certification in 1978 at Tampa Bay Vocational Technical School. She became a certified Orthodontist Assistant in 1997 and completed a course in lmplantology Assisting. Jackie has years of experience in all phases of dentistry with both clinical and administrative positions, which gives her the ability to address any dental treatment or financial concerns you may have. Jackie was initially added to the team as a Dental Assistant. She was then promoted to the position of Financial Coordinator and is now our Office Manager. Jackie is truly committed to building a strong relationship with our patients and works closely with Dr. Skupny to ensure our vision is met. She is usually there to greet you with a friendly smile when you first walk in. Jackie's commitment to our practice is reflected through her strong work ethics, special attention to detail, and joyful personality that is indicative of her character. Jackie was born and raised in Tampa, Florida. She is married to her soulmate, Daniel. He served 22 years in the US Coast Guard which allowed Jackie to gain varied dental experience in Virginia, New York, and Alaska. They have three beautiful daughters and four grandkids. She and Danny enjoy camping and the great outdoors with their rescue dog, Talulah, and are active members of Faith Bible Church in Naples. Suzie joined this practice in 1995 and feels very blessed to be able to provide excellent care to our patients. Suzie began her career in dentistry in 1974 as a dental assistant. She graduated in 1977 from Palm Beach State College as a Registered Dental Hygienist. She practiced Dental Hygiene in Eagle River, Alaska for nine years before moving back to Naples. Suzie is certified by the State of Florida to administer local anesthetic. She has advanced education in periodontal therapy from the University of Florida and continues to attend countless hours of continuing education each year. Suzie strives to help our patients obtain and maintain optimal dental health in the most gentle and caring manner. Suzie is a past president of the Collier County Dental Hygiene Association, past president of the Alaska Dental Hygiene Association, and served five years on the advisory board for the dental hygiene program at Anchorage Community College. Suzie grew up on Marco Island and enjoys fishing and shelling. She has been married since 1983 to Mike (Ben) Benfield and has two grown sons. The oldest is married, has a little girl born October 2016, and lives in Nashville Tennessee. Their younger son lives in Macon GA and was married in November 2017. Suzie and Ben are active members of their parish where she is an Eucharistic Minister. Karen joined this practice in 1997 and strives to continue providing quality care for our patients. Karen earned a bachelor's degree in Speech Pathology at North Dakota State University in Fargo, North Dakota. After graduation, she worked as a Speech pathologist in California and Washington state for a few years. Then, as a newlywed, Karen and her husband David moved to Alaska. It was there that she became interested in pursuing a career in dentistry. Karen graduated from University of Alaska Anchorage as a board certified Registered Dental Hygienist. Karen practiced dental hygiene in Anchorage until she and her family moved to Southwest Florida. Karen obtained her board-certified license to practice Dental Hygiene in Florida. In the Naples area, she has enjoyed working in periodontal, family, and aesthetic dental practices. Karen is always expanding her skills and deepening her knowledge through many hours of continuing education courses through the University of FL, Nova Southeastern University, and other sources. Karen and David have a daughter, Summer, and are blessed with two grandchildren. You may see them riding motorcycles on the weekends or watching the Florida Everblades Hockey games. They also love traveling. She and David enjoy raising orchids and share their home with 2 dogs and a cat-all of which are rescue pets. Lucinda joined our team the June of 2017. She feels incredibly grateful to be a part of such a wonderful dental practice. Lucinda is a 2005 graduate from FL Gulf Coast University with a bachelor's degree in Criminal Justice/Forensic Science. In 2015, she returned to school to pursue a career in Dental Hygiene. 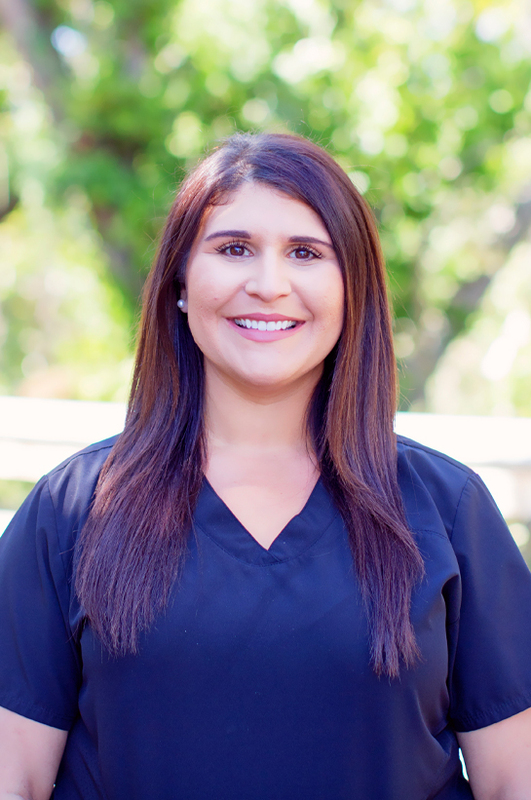 Lucinda graduated in 2017 as a Certified Registered Dental Hygienist from FL Southwestern State College. She graduated as Valedictorian of her class. Lucinda is certified by the State of Florida to administer local anesthetic. She is an active member of the Florida Dental Hygiene Association, as well as serving on the Dental Hygiene Advisory Board at FSW for the past two years. Lucinda participates in numerous continual education courses each year to enable her to provide the best dental care for our patients. Her bubbly personality is her greatest attribute. Lucinda was born and raised in Ft Myers, FL. She recently relocated to the Naples area with her husband Glenn and their three young sons. Boating is her favorite way to spend quality time with her boys. Tia joined our team in January 2011. She absolutely loves her career choice. Tia graduated from Barron Collier High School in 1986. She then had the desire to pursue dentistry. Tia received her Dental Assistant Certification from Manatee County Vo-Tech in Bradenton, Florida. She has been a Dental Assistant since 1988. Tia earned a certificate in lmplantology Assisting as well. She loves to work with people. Tia has a smile that lights up a room and a gift of putting our patients at ease. Tia's most precious and prideful experience has been raising her two sons, Alex and Andy. She and her sons enjoy spending time with their family and friends, love the outdoors, and going to the North Carolina mountains, as well as being strong in their faith. Kristina joined our team in August 2016 and is thrilled to be a part of such a dynamic practice. Kristina received her Dental Assisting Certification in 2010 in Orlando, Florida. She has been loving the dental field ever since. Consequently, Kristina has decided to further her education and pursue a degree in dental hygiene. She is currently studying at Florida Southwestern State College. Kristina was born and raised in Houston, Texas. However, if you ask her Naples has always felt like home! When she is not studying, you can find her at the beach, taking a yoga class, or hanging out with her Dachshund, Jack. Kristina also enjoys checking out local restaurants with her boyfriend. Alex joined our team in October 2017. She feels so grateful to be welcomed by such a warm and friendly group of professionals. Alex graduated from Island Coast High School in Cape Coral in 2012. She has always felt comfortable with her dentist growing up and decided she wanted to make others feel the same way. In 2014, Alex earned her Dental Assistant Certification in Ft Myers, Florida. Alex had previous administrative experience and soon found she could combine her passion for dentistry while utilizing her administrative skills. Her attention to detail and warm demeanor is appreciated by our patients. Alex was born and raised on a small back-yard farm in Indianapolis, Indiana. She moved to Florida nine years ago. Alex enjoys spending time with her daughter, Raelynn. She and Raelynn's father enjoy working their cattle, riding horses, and living a true country lifestyle.